"An unbelievable rich twist on au gratin potatoes, this casserole develops a caramelized, cheesy, roasted-garlic crust as it bakes. However, this dish does not save well (leftovers tend to separate and become oily), so eat up! Wonderful with a ham dinner." Preheat oven to 325 degrees F (165 degrees C). Lightly grease a 9x13 inch baking dish. In the prepared dish layer 1/2 of the potatoes, 1/2 of the cheese, then the remaining potatoes. Melt the butter in a small skillet over medium heat. Saute garlic until fragrant and golden brown; pour over potatoes. 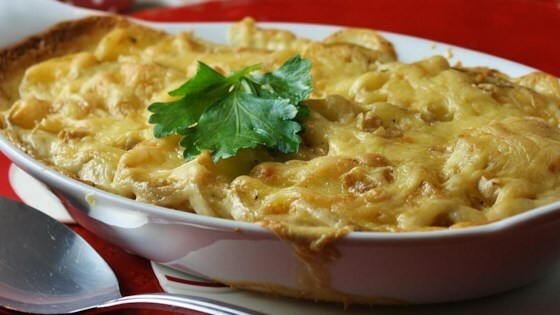 Combine cream, salt and pepper; pour evenly over potatoes and sprinkle with remaining cheese. Bake in preheated oven for 75 minutes. Serve immediately. See how to make the best creamy scalloped potatoes. Made this dish with Christmas Dinner and it was a smash hit. I made extra layers of potatoes topping each layer with garlic butter and cheese. Lightly sprinkled top with flavored bread crumbs.